Born in Louisiana, Johnny Adams vocal style was rooted in his gospel upbringing and the popularity of R & B from the 50s through the 70s. Signing with Rounder in 1982, Adams had the experience of the chitlin' circuit, some 45 sides, and a powerful determination to succeed behind him. The fertile New Orleans scene cultivated Johnny's soul-filled brand of R & B that is packed with tangential spicings of jazz, blues, and pop. Johnny, with big band flair, opens with the standard "I Feel Like Breaking Up Somebody's Home", done funky-sytyle with Walter 'Wolfman' Washington on the guitar. Doing the Pomus/Rebannack "Happy Hard Times", Adams swoons around Dr. John's piano and Duke Robillard's sweetly jazzed axe. The deep vocal delivery and cabaret feel of "I'll Only Miss Her When I Think Of Her" is a 1985 cut that floats atop David Torkanowsky's job on the piano ivories. And don't miss Alvin 'Red' Tyler's slow and easy saxophone solo on the same. Next up is Johnny's now well-know duet with Ruth Brown, Willie Mabon's "I Don't Know". Listen closer to assess the phenomenal piano by Bobby Foster, and again the Robillard axe. Digging into the soul bag, Adams pulls out classic renditions of John Hiatt's "Lover Will", Dan Penn's "One Foot In The Blues", and more material from Robillard, Doc Pomus, Percy Mayfield, George Gershwin, and others. On this biscuit, Johnny finds plenty of help from Duke Robillard, Walter Washington, Dr. John, and other prominent guests like Brown, Aaron Neville, and Harry Connick Jr. on "A Lot Of Living To Do". Closing with the traditional spiritual, "Never Alone" Johnny Adams wraps up one of the finest R & B-soul releases of the year. 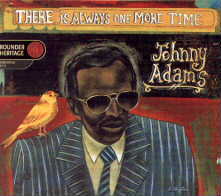 With material spanning his fifteen-year Rounder career, singer Johnny Adams has packed more soul into this container than anyone may imagine! Don't miss it! This review is copyright © 2001 by Mark A. Cole, and Blues On Stage at: www.mnblues.com, all rights reserved. Copy, duplication or download prohibited without written permission. For permission to use this review please send an E-mail to Ray Stiles.